Rafael Nadal and Serena Williams are two of the most dominate players in the world of tennis and a youngster from Waiakea is also dominating her competition here on the Big Island. 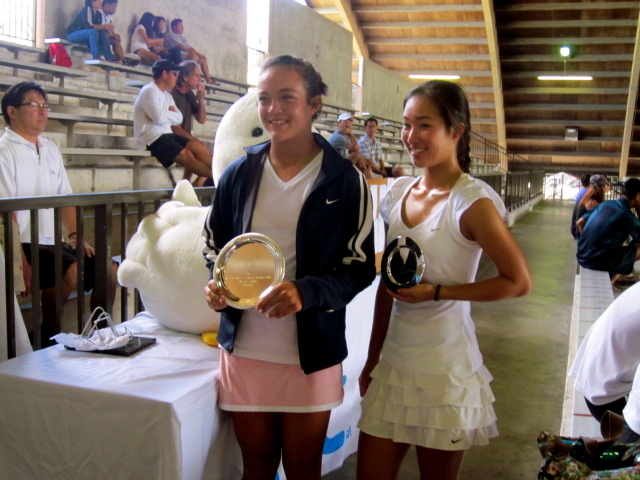 Hilo tennis sensation Sarah Dvorak just keeps on winning. The 14 year old who just entered the 9th grade at Waiakea High continues to turn heads while keeping her opponents off balance. Dvorak recently won two tournaments, playing at the 18 year old division and defeated #1 ranked Sarah Kukino, not once but twice in straight sets. 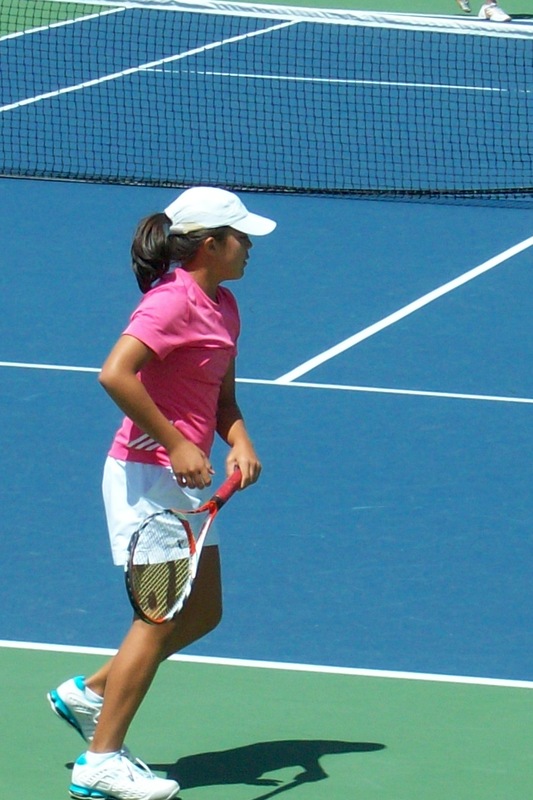 During the Hawaii State Junior Championships, from August 12 – 15 Dvorak matched up with Kukino in the girl’s 18 championships, winning 6-1, 6-4. A month later, Sept 3-6, it was again the #2 seed, Dvorak, this time playing for the Hilo Fall Junior Sectional Championship against #1 seed Kukino with similar results. The Waiakea freshman beat the Kauai senior in straight sets 6-4, 6-4. The Hilo Junior Tennis Club hosted the four day tournament which saw play at both the Waiakea High courts and the Edith Kanaka’ole Tennis Stadium in Hilo. Director of the Sectional Championships, Michael Miyahira, had praise for the young Dvorak. Dvorak’s victories over Kukino were huge accomplishments as Kukino is the defending Kauai Interscholastic Federation individual champion and the Hawaii High School Athletic Association’s 2010 state runner-up. Kukino’s only loss during the 2010 prep tennis season came at the hands of the eventual state champion, Kealakehe’s Sayo Tsukumoto. Tsukumoto’s only loss last year came at the hands of Dvorak in a United States Tennis Association sanction tournament. Tsukumoto was a senior in high school at the time while Dvorak was in the 8th grade at Waiakea Intermediate School. Dvorak has been cross training with Robin Takahashi since the fourth grade as they work on variety of skills to promote strength and endurance. “We (Takahashi) do suicides and we use the medicine ball. He gets me to work on my legs and recently has placed more emphasis on my upper body,” Dvorak said. Dvorak also heads to Kona on a regular bases and uses the coaching skills of Evan Schermer to develop into a formidable tennis player. “Coach Evan and I have been working together since sixth grade and I owe a lot of where I am today to him,” she said. Dvorak is currently ranked by www.tennisrecruiting.net as the number 59th incoming freshman in the nation, but Schermer believes that she will move much higher in the national rankings in the next two years. Despite winning her last two tournaments in the 18 year old division Dvorak still sees a lot of work ahead. The Warrior freshman contributes much of her demanding schedule to effective time management. “I have to juggle school, practice and home activities and I have learned to manage my time well,” she said. “I’ll practice with players that are better than I am, usually boys or adult men, so that I can react to the big serves and make solid returns. When Zandrix (Acob) was here I would practice regularly with him,” Dvorak said. (Acob is another 14 year and is ranked as the #3 player in the USAT Hawaii Pacific Section 18 year old division). Due to Dvorak’s financial inability to play regularly on the USAT Hawaii Pacific Sectional circuit she remains ranked as the #2 player in the state at the 18 year old division with Kukino retaining the #1 state ranking. “My parents are sending my older sister, Joyce, to college at Seattle University so I’m not able to afford to play in all the tennis tournaments throughout the state,” Dvorak sad. Claremont, CA (February 17, 2010) – Hawaii’s Zandrix Acob claimed the USTA Boys’ 14 National Open singles title held at the Claremont Club in California during February 13-17. Acob was seeded No.2 at this tournament and met the No.1 seed, Toshiki Matsuya from Redmond Washington in the final. Acob didn’t lose a set throughout the entire tournament and claimed the title by a walk-over from the Matsuya. With this win, Acob now has a No. 15 national rank in the USTA Boys 14. Pinned as Hawaii’s next rising junior phenom, Acob has consistently dominates section tournaments and rankings. Last year, he took the USTA National 12 and Under Singles Championship Title in the Copper Bowl and won the Gold Feed-In Consolation Singles event at the Winter National Championships held in January in Arizona. Making his debut at both events, victories were a week a part showing he was in condition for the national competitions. His on the road accomplishments last summer convinced him that he was ready for the challenge. Acob was one of 10, specially selected juniors picked to participate in the USTA Player Development Camp last fall at the USTA Training Center in Boca Raton, Florida. These up-and-coming junior players worked with USTA National Coach, David Dilucia on-court and had daily fitness training by USTA National Strength and Conditioning Coach, Satoshi Ochi. 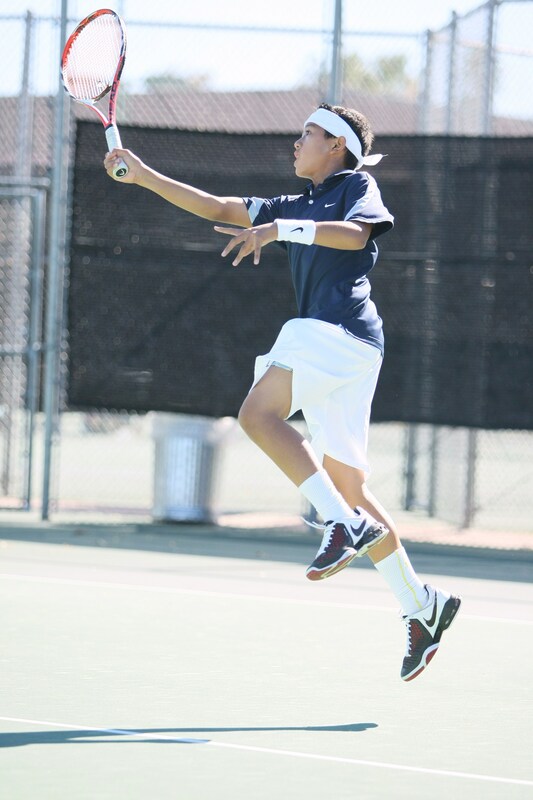 Rancho Mirage, CA (April 18, 2010) – Zandrix Acob takes the Boys’ 14 singles consolation round at the Easter Bowl held April 11-18, 2010. Acob, seeded No. 6 beat Mac Roy from Texas, 6-4, 6-4 in the finals. Earlier in the quarterfinals of the consolation round, Acob upset the No. 1 seed Daniel Kerznerman from New York 6-2, 6-1. Acob placed fifth overall in the tournament and is currently ranked No. 6 in the nation. In doubles, Acob and partner Jordan Belga from Illinois fell in the quarters. Belga captured the championship singles title. To be good at a sport you need to play against the best competition and for 13-year old Sarah Dvorak finding the best tennis players to compete against often means traveling to the mainland to enter tournaments. Over the weekend Dvorak and her family drove over to the West Side of the Island to enter the Queen K Tesoro Annual Fall Mixed Doubles Tournament hosted by the Royal Kona Tennis Club and her coach, Evan Schermer. Schermer came to Kona from the Pennsylvania area where he coached tennis for Robert Morris University. “Sarah has a tremendous work ethic and she maximizes her potential by working really hard,” he said. During the 2009 junior tennis season Dvorak, in her quest to play the best has often entered the older, high school age division, to gain the most experience. Earlier in the year Dvorak played in the 18 year old bracket of the West Hawaii District Junior Championships and then went on to compete in and win the 14-year old division of the Nike Junior Tournament a month later. Dvorak advanced in the West Hawaii District tournament by beating three time Big Island Interscholastic Federation tennis champion, Sayo Tsukamoto of Kealakehe, winning in straight sets 6-2, 7-6. Over the Labor Day weekend Dvorak, an 8th grader at Waiakea Intermediate School, won the Hilo’s Fall Junior Sectional Tennis Tournament Championship while playing in the 18-year old bracket. By mid September Dvorak was competing in the Nike Tournament in California where she faced experienced players in the 14 division. While her serve and ground strokes are very competitive she still lacks the high caliber play that is found at the national tournament level. At the end of October Dvorak played in the North Hawaii Tennis Association Junior Championships where she finished second in the 18 division losing to Sarah Kukino in the finals 7-5, 7-5. Despite last month’s loss Dvorak is ranked at number 5 in the state for the 18 year old division and has compiled a 13-3 record during 2009. “Tennis players are 100 percent made on so much technique and Sarah still needs help in this area,” Coach Schermer said. Dvorak’s coach believes that there are other areas in which the youngster needs to work on to become a better player and that playing older girls have helped her game improve. Now the focus is to send the talented youngster to play in the USTA National Winter Championships in Scottsdale, Arizona to face some of the best competition in her age division. The Winter Championships run from December 27 to January 1 and if Dvorak qualifies she will then compete in the Copper Bowl Tennis Tournament held in Tucson from Jan 2 – 7. Dvorak’s family must decide prior to December 3 if Sarah will be competing at Nationals over the holidays and their decision will be based on finances. Dvorak’s mother, Rose, who is a tennis coach at St. Joseph High School believes that the cost of getting Sarah to play in Tucson during the holidays could exceed $3,000 a price tag that would put a strain on the families budget. If anyone would like to help Sarah Dvorak with her travel expenses the family is accepting donations which can be mailed to: Rose Dvorak, P.O. Box 1154, Kurtistown, HI 96760. While the world was watching 17 year old sensation Melanie Oudin in the Women’s Open Tennis Tournament from New York while tennis eyes in Hilo were focused on 13-year old Sarah Dvorak. Dvorak was busy during the Labor Day weekend working her way through the field of 16 in the 18 year old bracket of the Hilo’s Fall Junior Tennis Sectionals Championships. 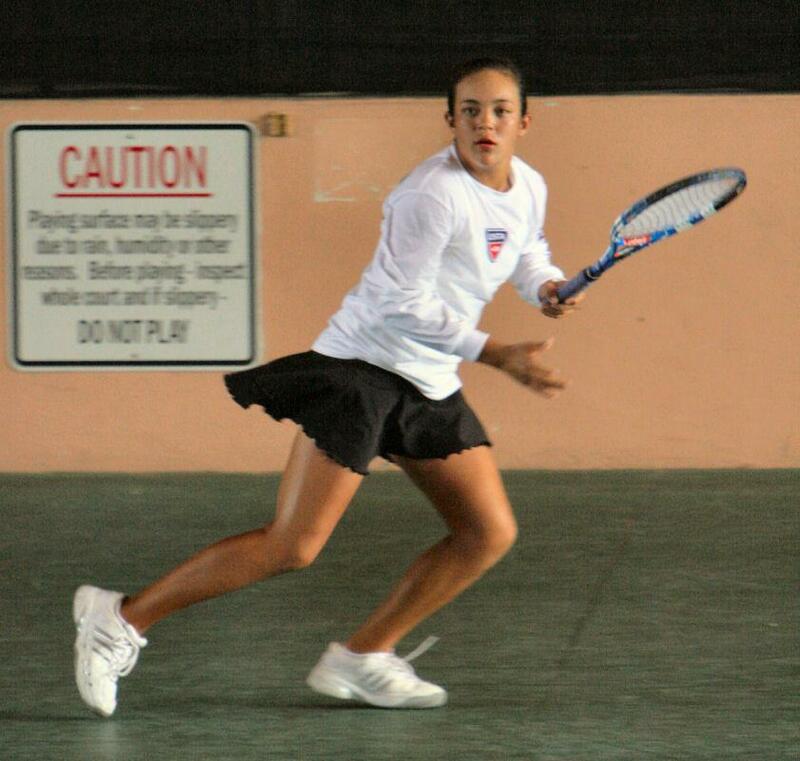 Dvorak, an 8th grader from Waiakea Intermediate with a remarkable ability to return the ball from the baseline, fought her way past much older and more experienced players to capture the Pacific Sectional title by defeating Honolulu’s Kelly Ann Domingo, the number one seed, in the finals by a “pro set” score of 8 to 5. To accommodate the need to get in all the matches Tada and his staff instituted the “pro format” scoring which had the first player reaching eight points winning their match. “The rain and the delays didn’t really bother me, as I’m used to it,” Dvorak said. In the first round of competition Dvorak needed to get by Oahu’s Bobbi Oshiro. “It was tough as she (Oshiro) moved me around a lot and she kept the ball in play,” Dvorak said. Overcoming a first set loss, 4-6, Dvorak rallied to win the second set 6-4 and won the tie breaker 10-7 against a scrappy Oshiro. Dvorak’s coach, Evan Schermer, has played her in the older, more experienced brackets, in order to face stiffer competition. “It was a joint decision between my coach, my mom and me to enter the 18 year old bracket,” Dvorak said. Dvorak’s mother, Rose, is the veteran tennis coach at St. Joseph High School. “My mom has been helping me for years and my coach, Evan, has been coaching me for the past six months. I owe a lot to my coaches and I’m very grateful,” she said. “I lack enough playing time in the 18 year old bracket to be seeded, and I haven’t accumulated enough points. That is why when I enter these tournaments I’m not seeded,” she said. The Fall Sectionals started on Friday evening with 115 juniors participating at three different sites which included Waiakea High, Hilo Intermediate and the Edith Kanaka’ole Tennis Stadium and ended with the finals on Monday. 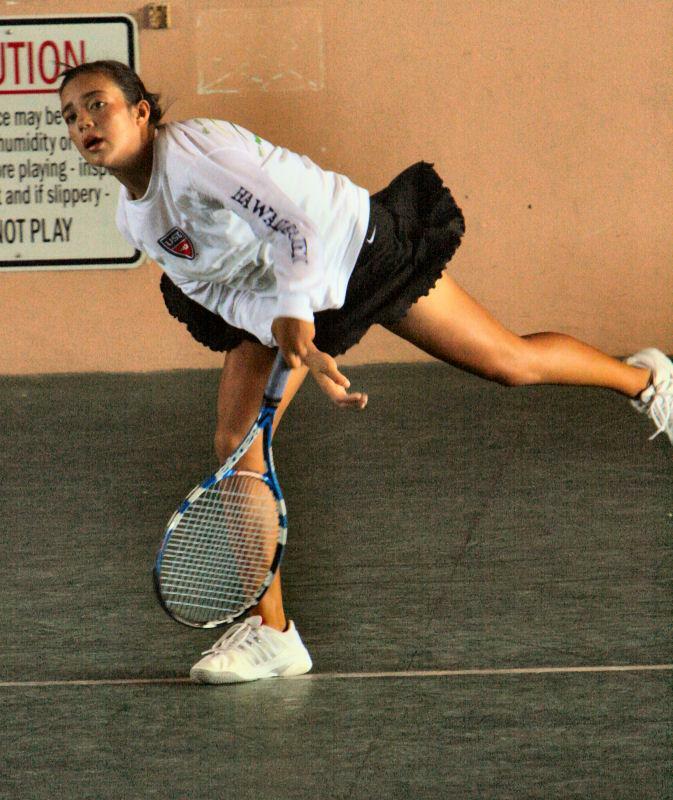 Earlier in the year Dvorak warmed up by playing in the 18 year old bracket of the West Hawaii District Junior Championships in May then went on to win the 14 year old division of the Nike Junior Tour tennis championships in June. To advance in the West Hawaii District tournament Dvorak need to get past three time Big Island Interscholastic Federation tennis champion, Sayo Tsukamoto of Kealakehe, winning in straight sets 6-2, 7-6. Next up for Dvorak is the Nike Tournament in California beginning on September 18. “I’ve entered the 14 year old bracket and I’m hoping to do well,” she said. “I think she’s (Dvorak) an excellent player with a good all around game. She is very competitive and has a promising future in tennis,” Tada said. Rising tennis stars Sarah Dvorak and Zandrix Acob sweep their ways through the finals of the DT USA Nike Summer Section Tennis Championships in Honolulu to qualify for the national championships. Dvorak, a soon to be 8th grader at Waiakea Intermediate School, warmed up for the sectionals by playing in the West Hawaii District Junior Championships held in late May. Playing in the Girls’ 18 Singles in the West Hawaii Championships Dvorak had to work her way through the consolation bracket after losing a tough opening match. “My coach (Evan Schermer) told me that if I want to be very good I need to play the best players, so we decided to enter the 18 singles, even though I’m only 13,” Dvorak said. The soon to be eighth grader persevered by winning her opening match in consolation before facing Hilo’s Kendall Tada in the semi’s. Dvorak eliminated Tada by identical scores of 6-2, and then faced Kealakehe’s Sayo Tsukamoto in the finals. Tsukamoto is the three time Big Island Interscholastic Federation girls champion and has finished third in the Hawaii High School Athletic Association tennis championships for the past two years. Dvorak, who was unseeded going into the tournament defeated Tsukamoto in 6-2, 7-6 to win the Consolation bracket championship. The left hand Dvorak also brings to the courts a solid serve with very few double faults that allows her to stay in all of her matches. “I need to work more on my volleys as that is probably the weakest part of my game,” she said. Entering the Nike Sectional Play in Honolulu on June 11 Dvorak was again unseeded and needed to start play in the group of 32. Dvorak managed to fight her way through the competition before playing in the championship finals against the number one seed, Julia Weisel, for the lone automatic berth to nationals. In a highly contested match Dvorak pulled out another exciting win of her young career with straight set victories 7-5, 6-2. “I don’t get to play in many tournaments because of the travel cost and that is probably the reason that I come into these tournaments unseeded,” Dvorak said. “My coach (Schermer) really helped my game as he makes me try my best. I was really confident coming into this tournament and I really wanted to win,” Dvorak said of her sectional victory. Dvorak also had high praise for University of Hawaii at Hilo conditioning coach, Robin Takahashi. “He’s (Takahashi) really helped a lot of us in our strength and conditioning as a lot of high school tennis players go to him after school to get in shape,” she said. Even after winning sectionals and advancing to nationals the jubilant Dvorak believed that her previous victory over high school champion Tsukamoto was her biggest. “My win over Sayo remains as the biggest tennis victory in my life,” she said. Zandrix Acob is no stranger to junior tennis in Hawaii as the youngster maintains the states number one ranking for Boys’ 14. Acob started 2009 off with a bang by winning the Copper Bowl Championship in Tucson, Arizona for Boys’ 12 before turning 13 in March. The youngster has just completed the seventh grade at Hilo Intermediate School and isn’t sure where he might be next year. “I’ve been talking with my parents about possible changing schools next year, but we still haven’t decided,” he said. At the Nike tourney in Honolulu last week Acob defeated his first three opponents in straight love sets before beating Marcel Chan in the finals 7-6 (2), and 6-2. “I think I’m playing my best right now and my opponents are having a hard time adjusting to my game,” Acob said. “He’s (Drosdick) really strict and he has changed almost all aspects of my game, from my forehand to my backhand and even my serves,” Acob said. With their sectional victories Dvorak and Acob have won from Nike roundtrip transportation, food and lodging for themselves to play in the NJT USA National Masters at Stanford University in California from September 18-20. Winners of the National competition will then advance to play in the NJT International Masters in the Dominican Republic in October.